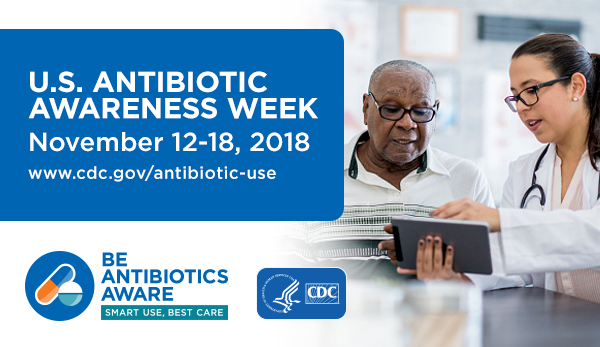 This important week alerts individuals to the growing threat of antibiotic resistance – a serious public health issue – and urges everyone to use antibiotics appropriately. Antibiotic resistance is when bacteria in your body are able to fight the drugs designed to kill them. The antibiotics become useless, and the harmful bacteria are still in your body. How does antibiotic resistance occur? Resistance happens when you are exposed to antibiotics inappropriately or over and over again. Use antibiotics appropriately! This means only taking antibiotics that are prescribed to you, and to take your antibiotics exactly as they are prescribed. It is also important that you do not take antibiotics for infections caused by viruses, because antibiotics do not kill viruses. Some common infections caused by viruses are the common cold, the flu, and most sore throats. To raise awareness for this week, the Healthcare-Associated Infections and Antimicrobial Resistance (HAI/AR) team at VDH challenged nurses across Virginia to join the fight by studying educational material about antibiotic resistance and completing a quiz to test their knowledge. This initiative was designed to help your nurses protect you from antibiotic resistance. The challenge will wrap up on November 15th. Keep an eye out on the VDH social media pages for results! The HAI/AR team also released a special edition newsletter about Antibiotics Awareness Week, which spotlights hospital systems committed to reducing antibiotic resistance. We hope you will use the resources provided in the above links to arm yourselves with information and do your part to reduce antibiotic resistance!